JJC LH-25 Lens Hood is dedicated to Nikon AF Zoom-NIKKOR 24-85mm f/2.8-4D IF and AF-S VR Zoom-NIKKOR 24-120mm f/3.5-5.6G IF-ED lenses. It helps to minimize flare by deflecting stray light from entering the lens. In addition, the "petal" shape of this lens hood maximizes the amount of hood coverage for the minimum amount of weight and hood area. There is no vignetting with the hood on. The hood allows you to put on filters and a lens cap. The hood can also be placed backwards over the lens for compact storage. The hood provides additional protection for the lens from accidental impacts, bumps, and scratches. 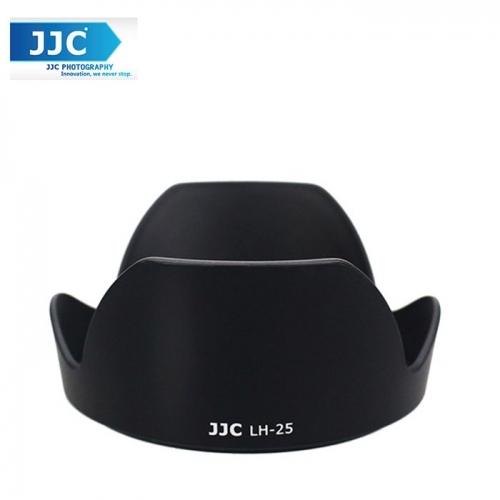 JJC LH-25 Lens Hood replaces Nikon HB-25 lens hood.